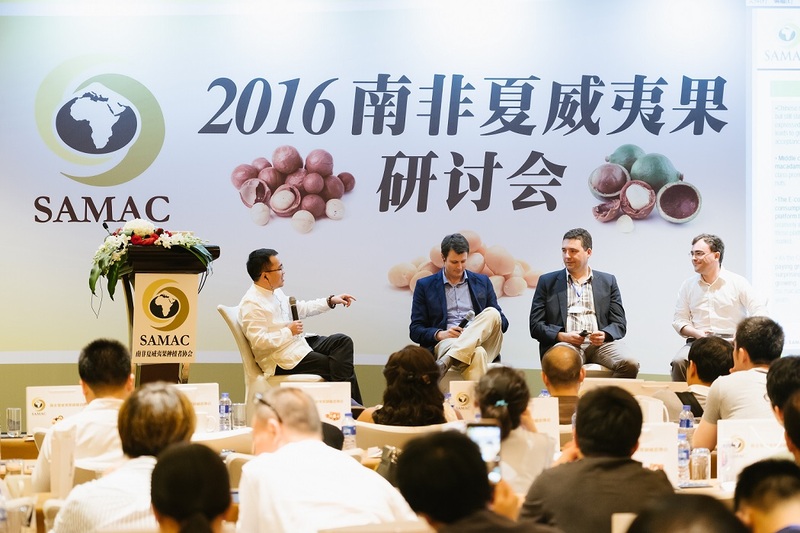 Initiated by Subtrop BD Manager Bonnie Buthelezi, the first South African Macadamia Seminar was held in Shanghai on June 22, presented by Walter Giuricich, SAMAC Chairman, and Barry Christie, SAMAC Operations Manager. They introduced the planting, export, and trade of macadamia nuts from South Africa. Altogether 80 major importers, distributors, and e-commerce leaders participated in the event. South Africa is the biggest exporter of macadamia nuts globally and production is still developing at a rapid pace, with an increase of 1,500 hectares per year. SAMAC has 470 members, out of the 500 total planters of macadamia nuts. During the past 20 years, South African macadamia nut production has exhibited a huge increase from 1,211 tons in 1991 to 46,000 tons in 2015. Sales have increased from 32 million to 4 billion South African Rand. The number of trees has increased from 1 million in 1996 to 6.5 million in 2016, altogether covering 21,500 hectares. Apart from natural challenges, Mr. Giuricich also mentioned the trade barrier that African nuts have to face. Since the Sino-Australian Free Trade Agreement came into effect, Australian macadamia nuts enjoy an import tax of 14.9%, while that for South Africa stands at 19%. This requires both governments and those in the industry to work together so that Chinese consumers will eventually be able to enjoy more macadamia nuts from South Africa. South African macadamia nuts have started to enter mainland China, Hong Kong region, Vietnam, and other far eastern countries since 2009, with sales in this region constituting half of South Africa’s production and standing at over 20,000 tons. Mr. Giuricich explained how macadamia nuts are rich in phosphorus, calcium, iron, vitamins B1 and B2, and eight amino acids, and are attractive with their smooth and fragrant taste. Thanks to the fast development of the Asian market, exports of such nuts have enjoyed a tenfold increase over the past six years. The US and Canada remain the largest macadamia kernel market, with Europe, the Middle East, and Japan following. In 2009, kernels maintained their fast increase rate with a production of around 22,000 tons and surged to a historic high of 26,000 tons in 2014. Matthieu David, CEO of Daxue Consulting, revealed a research result at the seminar, saying that actually such nuts are also planted in China’s Yunnan Province and are welcomed by middle-class consumers. He said that New-generation consumers tend to buy healthy, high-protein, safe, and high-quality food and prefer nuts in shells very much due to the safety and hygiene factors. Apart from nut in shell, kernels and oil are two of the other main forms of this product. In the interactive session, Yu Zhongwu hosted the discussion on the challenges and opportunities for South African macadamia nuts. Participating enterprises posed questions on the planting standards, varieties, sourcing, and production of such nuts. Furthermore, many consider South Africa as their preferred sourcing destination, due to the high-quality products grown there. Moreover, they hope to cooperate more with suppliers to further expand on China’s consumer market. Mr. Giuricich advised interested parties to visit www.samac.org.za to view the name list of exporters and processors with a good reputation and high credibility. Meanwhile, Mr. Christie advised that it is not recommended to buy directly from plantations, since most of them do not have adequate processing capabilities and are therefore unable to ensure the end-product quality.